A domain name consists of two parts : the name and an extension. A domain name “yournameontheweb.com” consists of a domain name “yournameontheweb” and an extension “.com”. The .com extension is a generic, international, Top Level Extension. 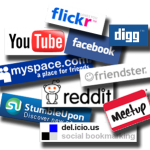 Other generic Top Level Extensions or TLDs are .org, .net, .biz, .info, .mobi and a few others. Apart from generic TLDs , the domain extension can also be country- specific e.g. “.us” (US), “.de” , “.ie” (Ireland). Some country TLDs consist of two parts e.g. “.co.au” (Australia’s TLD) or “.co.uk” (UK TLD). Which domain name extension is the best? Your domain name is very important, not only from a branding perspective but it also helps with search engine optimization. You should therefore give it some serious thought, instead of picking the first name that appeals to you. A good domain name should be short, memorable, credible, related to the core business of your company or your brand, and not easily confused. Ideally, it should also include your most important keyword or keywords (unless it is a corporate site and is used to promote a specific brand). If you would like some help with keyword research, finding a good domain name or domain name registration, give us a call. We can sometimes find you a pre-owned domain (either an existing domain name or an expired one) . Older domains rank better in Google, so if you can find a good one, buy it. If you prefer to register your own domain name, we recommend you use Namecheap. We use them for all our domain registrations because their admin panel is very easy to use, their prices are the the lowest and we have never had any hassles with their service. Forrester Research published recently a new five-year forecast predicting that online sales in the U.S. will keep growing at a 10 percent compound annual growth rate through 2014. It forecasts that online sales in the U.S. will be nearly $250 billion, up from $155 billion in 2009. 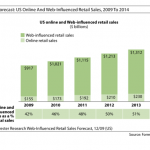 Last year, online sales were up 11 percent, compared to 2.5 percent for all retail sales. While $155 billion worth of consumer goods were bought online last year, a far larger portion of offline sales were influenced by online research. Forrester estimates that $917 billion worth of retail sales last year were “Web-influenced.” This means that many customers although they buy from the store, they first research the products or the suppliers online. It also estimates that online and Web-influenced offline sales combined accounted for 42 percent of total retail sales and that percentage will grow to 53 percent by 2014, when the Web will be influencing $1.4 billion worth of in-store sales. In Western Europe, Forrester expects a slightly faster 11 percent growth rate for online sales, going from $93 billion (68 billion Euros) in 2009 to $156 billion (114.5 billion Euros) in 2014. The European online retail market, which includes the EU-17 — Austria, Belgium, Denmark, Finland, France, Germany, Greece, Ireland, Italy, Luxembourg, the Netherlands, Norway, Portugal, Spain, Sweden, Switzerland, and the UK — will increase at a growth rate of 11% over the five-year forecast period. These business-to-consumer (B2C) online sales are continuing to rise at this double-digit growth rate because most Western European countries’ online retail sales are still relatively immature. Need more proof that online marketing works? In the first quarter of 2010, Dominos Pizza online sales reached £23 million, despite the recession. Reliable Irish online sales statistics are difficult to obtain, but with broadband being now available in most parts of the country and the current economic squeeze, Irish shoppers increasingly look for bargains online. If you don’t get on the bandwagon now, you are going to miss the boat.